With so many sea kayak companies out there why should you choose Paddlers’ Realm? What’s behind our name? Paddlers’ who have a passion for the sport and the Profession, for the water and immersion in nature. – Provide guide certification for many other outfitters in Southcentral Ak. Whittier has been my base since 2001. Extended and day trips within Passage Canal, Blackstone Bay, Harriman Fjord, Icy Bay, Port Nellie Juan, College Fjord, Unakwik Inlet, have been my staples. These trips along with personal exploratory journeys, both solo and with friends, from Valdez to Whittier, Whittier to Cordova, Southwestern PWS to Seward, have allowed me to observe the spectrum of weather and sea conditions from flat water and blue bird skies, to gale force winds, massive seas and days of relentless rain. Living and traveling in these conditions for weeks at a time has provided me with the insight of how best to care for myself and others within these conditions. Paddling in truly remote regions of coastal Alaska illuminates the necessity to acquire the Wilderness First Responder certification and pursue personal kayaking skills/leadership training and certification and instructing/leadership certification. Through the British Canoe Union : the 4-Star Leadership Award and the Coach Level 2 awards, FSRT, Coastal and Open Water Navigation, and participated in Coach Level 3 training, as well as four 5-star training programs and the 5-star assessment. Through the American Canoe Association I have acquired the Level 4 Instructor certificate, Trip Leading Certification as well as the Adaptive Paddling Endorsement. I am also a guide with the International Sea Kayak Guide Association. This is a fantastic hybrid of coaching and guiding which no other association offers. Please view my profile! 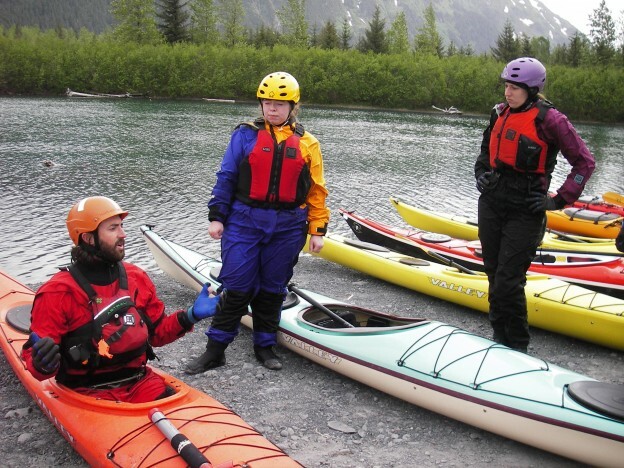 For 12 years I worked as an instructor for the Alaska Kayak School offering beginner through advanced instruction throughout the summers and pool sessions throughout the winter. We also ran guide certification programs: American Canoe Association Coastal Kayak Day Trip Leader Course. Pursuing these credentials has allowed me to train in Washington: Neah Bay, the San Juan Islands and Puget Sound; California: Bodega and San Francisco Bays; Georgia: Tybee Island, Alaska: Cook Inlet, Kachemak Bay, Kenai Fjords, Shuyak Island and of course Prince William Sound; and most recently Cornwall UK. Personal and Guided Trips include: Valdez to Whittier, Whittier to Cordova, Shuyak Island Circumnavigation, trips throughout Seward, Kachemak Bay, Seldovia, Cook Inlet, Turnagain Arm, many trips throughout PWS, a portion of the coasts of Belize and Nova Scotia. I continue to provided instruction, assessments and guide certification for guiding outfits throughout Southcentral Alaska as well as beginner through advanced courses, instructional expeditions and certification for the public. 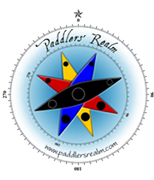 As the owner of Paddlers’ Realm I am afforded the opportunity to operate this company based on first hand research done throughout my personal and guided trips, instructional sessions, as well as working with many different outfitters and instructors/coaches. This integrated exposure provides me with the knowledge of how best to operate a sea kayaking business from the perspective of client, guide, instructor and owner. Provided guided outdoor activities, outdoor skills instruction, and wilderness trips since 1998. 14 years experience in the development, management, and supervision of outdoor programs. Paddling also consumes a lot of our personal time: whether it’s hiking or paddling up a creek to see what’s in the back of the valley, running whitewater, packrafting, paddle boarding, heading out into storms for some down wind runs, playing on the coast, traveling to gain more knowledge in surf, rock gardens tideraces, and looking for new water- any water, to put a paddle craft in and explore. What all of this means most to us is a dedication to and intimacy of paddling: sea kayaking, river kayaking, paddleboarding and packrafting. With this combination we hope to offer the safest and most memorable experience possible, providing a positive introduction and springboard for those who’ve never experienced paddle sports before and to continue to stoke the fire for those more experienced. Our passion for exploration and natural beauty, desire for adventure, and need-yes need, to be outdoors and active, brought me to Alaska and into the world of sea kayaking and paddling in general. Getting people on the water allows me to share the adventure of exploring this amazingly beautiful environment and to reveal the depth and richness to be discovered and acquired within these sports. I've joined Paddler's realm for kayak instruction and guided excursions. I've been thrilled with both. Ryan Collins is a great guide, and a gifted instructor. His expertise in kayaking, navigation, safety, and local knowledge of Prince William Sound run deep. He is a master at logistics, and will go the extra mile to develop the trip or class that suits your time, needs and experience. Ryan's passion is to spread the love for kayaking and the Prince William Sound. Whether you want a multi-day kayaking/camping trip, a multi-day trip sleeping on a boat in order to kayak more of the Sound, a basic day trip, or instruction, check with Paddler's Realm first. You won't regret it. We've kayaked with guides in Alaska previously and we've paddled on guided trips in the lower 48 as well - Ryan Collins at Paddlers' Realm set himself apart: patient (with some first timers who were with us), safety conscious, knowledgeable about wildlife and the area, great host at lunch with a gourmet spread, great sense of humor. We were with him for an entire day and throughout that time he kept us engaged and involved. One other thing: the water taxi service he works with is also a top-notch outfit - new boats that they keep clean as a whistle. If you're in Whittier and want to have a great paddle, this is the one you want to do.